What is the future of the Asian American church? How can we pursue health and longevity in our ministries, regardless of what “model” of ministry we find ourselves in? Asian American ministry leaders addressed these questions at the SOLA Network Leaders’ Dialogue, “A Conversation on the Future of the Asian American Church,” on September 27, 2018, in Brea, CA. On the panel were Hanley Liu, English pastor of First Chinese Baptist Church in Walnut, a trilingual Chinese church; Kim Kira, lead pastor of Lighthouse Church in Torrance, a pan-Asian-American church; and Steve Chang, lead pastor of Living Hope Community Church, an Asian-American church planted out of an English ministry of a Korean church. 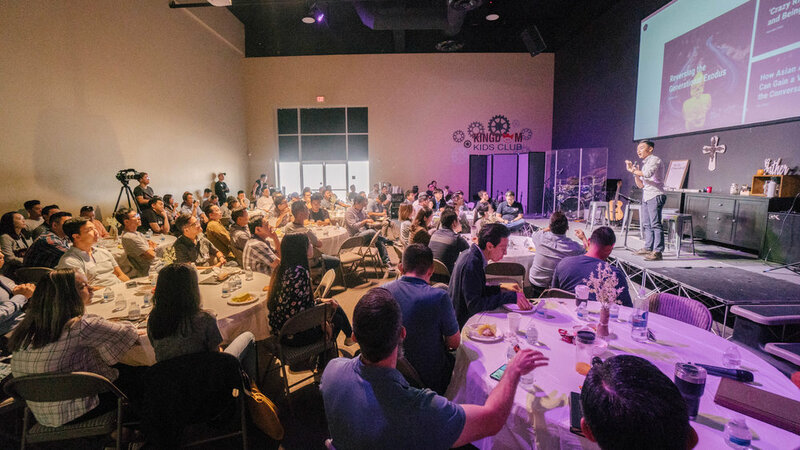 About 90 church leaders attended the dialogue and Q&A time, which was moderated by Michael Lee, lead pastor at All Nations Community Church, the English-speaking congregation that is interdependent with a Korean-speaking church. Here were some key takeaways from the conversation. ﻿Often pastors come into churches with ambitious dreams and goals for their ministries. But the seasoned pastors reminded us that our goal should be to love the church, not to follow our dreams. Working in a Chinese immigrant church, Liu had to learn to let go of personal ministry goals and instead learn to love his church, blemishes and all. He said we must be able to ask: Are we still able to faithfully proclaim the Gospel and love our people, even if it’s without some of our preferences? If we can, perhaps God has called us to minister in our current churches, even if it is messy. Chang pointed out that although personal giftedness is important, often leaders focus too much on it. Instead, we should focus more on our church’s unique calling. When we set aside personal ambition, we can honestly ask ourselves what God has specifically called our congregations to do and how we can lead our congregations to fulfill that calling. Too often, leaders focus on short-term results and growth. But good leaders focus on building churches that are healthy over the long haul. Kira’s church invests heavily in their internship program. Currently 7 out of his church’s 8 pastoral staff members are graduates of their internship program. In the same way, we must invest in leaders from the beginning, looking for people who are self-motivated and truly humble, who rejoice in seeing others succeed in ministry — all in a culture of grace. Chang noted that Asian-Americans are looking for a place where they can eventually raise a family. Though our congregations may start with relative homogeneity, our goal for them should be to create depth and breadth in which congregants can see people in the next stage of life who they can emulate. But these results only happen with patience and long-term relational investment. Chang noted that the relationships he invested in 25 years ago when his church was much smaller are still paying dividends in his church. How then can one survive in an immigrant church setting, especially when there are significant barriers and unhealthy dynamics? Liu encouraged leaders to choose their battles wisely. He himself focused on expository preaching and investing in the next generation, not fighting every battle. He had the support of the senior pastor, an essential factor, but he also worked to gain the trust of the senior leadership by honoring them in ways that were meaningful to them. For example, Liu initiated conversations and sought mentorship from his senior pastor privately and sought to honor him in public settings and leadership meetings. Over time, trust was earned and permission was granted to make changes. Chang also challenged leaders to ask the hard question: are we blame-shifting for lack of growth in our congregations? Often, the problem is not the immigrant leaders but rather our own shortcomings. What then is the future of the Asian-American church? Which model will prevail? Kira noted that we should follow the apostle Paul’s example and see our ethnicity as a gift to steward. Though Paul was not afraid to confront the idolatry of his Jewish culture, he also saw his Jewish background as a personal burden and a gift to shepherd, allowing him to minister to his fellow Jews in a unique way. Chang observed that our culture is shifting in its attitude towards Asian Americans. As America becomes more diverse, Asian Americans are being looked to for expertise in more areas, whereas they were ignored before. In addition, Chang said the future of the Asian-American church is unknown in such a changing culture. We must trust that our grandchildren will chart a course for the Asian-American church. Finally, Chang and Kira noted that there is much hope as we look at young leaders in the church today. Young leaders have more good theological resources than ever before, and they are leading the way in innovation and creative thinking. However, we must encourage our young leaders, many of whom are “spiritual orphans,” to lay deep roots and cultivate perseverance, a trait we can learn from our immigrant parents. As a church planter still working in close partnership with an immigrant Chinese church, I resonated with many of the insights shared in the panel. I was a “traditional” English pastor at our trilingual Chinese church for six years before the Chinese-speaking congregations blessed us to plant our English congregation as a new church one year ago. Though it was a struggle at times ministering in the traditional model, those six years helped me to develop and invest in our core group and build good relationships with my senior pastor and Chinese leadership. It is so true that having a Senior Pastor and key immigrant leaders championing our cause makes all the difference, but earning their trust takes time, patience and initiative. I am grateful for leaders like Liu, Kira and Chang, and my prayer is that younger leaders like myself will continue to seek wisdom from those who have gone before us as we chart the course for the future of the Asian American church. Ben Pun is the Lead Pastor of Anchor Community Church in Walnut, CA, which is partnered with its mother church, First Evangelical Church of Diamond Bar.